One of the biggest reasons why people love sit and go poker tournaments so much is because they’re simple, relatively quick and easy to multi-table. And if you’re one of the people who love how quickly sit and go’s finish, then you’ll really enjoy 6-handed SNG’s (a.k.a 6-max SNG‘s). 6-handed SNG’s only feature 6 players instead of the usual 9 or 10, which shortens the tournament duration by around 15 on average. But keep in mind that the shorter duration could also mean more money lost if you don’t know correct strategy for 6-max SNG’s. The best place to start out when learning 6-handed sit and go strategy is with the differences between regular and 6-max SNG’s. And the first big difference is that you need to open up your range of hands, and be willing to get involved in more pots. The reason why is because, with fewer players involved, the average hand isn’t going to be as good in 6-handed SNG’s, so you can’t sit back and wait for premium hands. Another difference worth noting is that steals are more common in 6-max SNG’s because there are fewer players to contest the steal. One more thing you will see in these sit and go’s is that it’s easier to isolate players when you have a strong hand. 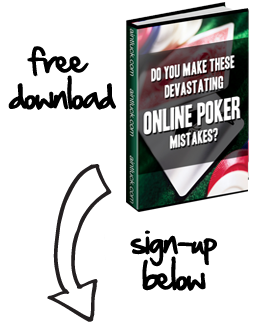 This of course makes premium pocket pairs even better because you don’t have to make as large of raises to isolate opponents with fewer people in the pot. For the most part, you should use standard SNG strategy in 6-max games. And if you need to brush up on standard strategy, take a look at this article. However, the small differences in 6-handed games means you need to adjust your strategy accordingly. For instance, when opening up your range of hands, you should be willing to play cards slightly out of your normal range. So if you normally only play AA-JJ, AK in early position, you should open your range up to include TT and AQ. Likewise, you should open your range of middle position hands from AA-88 and AK-JT to include 77, 66 and T9. The key is to open your range up a little bit more than you normally would. As far as stealing goes, you should be more willing to take chances and steal small pots when you’re in late position. As mentioned before, players are less likely to contest you (weaker hands), so you need to go for small pots in unraised hands. When isolating players with a good pocket pair, or strong suited connectors, you fortunately don’t have to make as large of raises to push other players out. Of course, when you do isolate an opponent, be aware that you’re both less likely to improve a hand on the flop or turn, so don’t fold immediately when raised or re-raised in these situations. As you can see, there isn’t a whole lot of difference between 6-handed and regular sit and go’s; however, managing the small differences is key to being successful in both types of SNG’s.